This Thursday the March for Life Education and Defense Fund, a pro-life organization which aims to “end abortion by uniting, educating, and mobilizing pro-life people in the public square,” unveiled a new pro-science theme for its 46th annual March for Life. “Science is behind the pro-life movement,” Jeanne Mancini, president of the organization, said at the opening of the event, which was held at the Rayburn House Building on Capitol Hill. One hundred years ago, our understanding of embryonic development and fetal development was very different that what it is now. We owe so many advances to medicine and science and technology, and they all continue to reaffirm the scientific fact and the truth that life begins at fertilization/conception. “‘No good scientist worth their salt says that life doesn’t begin at conception,’ Mancini added, quoting what an atheist scientist had once said to her in private. After Mancini played a video demonstrating the organization’s new theme, she invited a panel of various pro-life figures to speak in turn: David Prentice, vice president and research director of Charlotte Lozier Institute; David Daleiden, founder and project lead for the Center for Medical Progress; and Dr. Grazie Pozo Christie, radiologist and policy adviser with The Catholic Association. Each of the panelists discussed how scientific and technological advancements in the field of human development support the pro-life cause. Prentice began his presentation by noting that the idea that conception begins at the moment of fertilization is uncontroversial in the scientific community. “These are the scientific facts and this is a consensus, really, in the scientific world. The arguments aren’t really about biology. This is accepted science and has been for decades,” he said. Prentice also emphasized that improvements and advances in science have shown that unborn babies can survive outside the womb earlier that first thought, and that stem cells can be obtained from sources other than fetuses. Prentice called the notion that “You either let patients die, or you kill embryos and cure … ‘all known maladies’” a false dichotomy, pointing to alternative sources of stem cells. Christie, for her part, focused on the history of medicine and how doctors have traditionally viewed their role in dealing with pregnancy and childbirth. “Medical science has always been at the service of life, saving life, prolonging life and enhancing life,” she said. Christie also spoke about the ancient view that “the act of love was also an act of creation,” noting that the Hippocratic Oath explicitly prohibits doctors from providing women with abortions. “[The Hippocratic Oath] embedded these lofty ideals into the practice of Western medicine,” she explained. Next Christie turned to dismissing claims made by the abortion apologists. She said abortion “was sold to us as a scientific advance, maybe the ultimate scientific advance,” in the wake of the 1973 Supreme Court case Roe v. Wade, which legalized abortion in all 50 states. Christie compared Roe v. Wade against contemporaneous advancements in ultrasound in the 1970s and transvaginal ultrasound in the 1990s, which allowed parents to see their unborn child and listen to his or her heartbeats. These lies “turn medicine into murder and doctors into contracted murderers,” she said. Daleiden spoke about the circumstances surrounding his decision in 2014 and 2015 to go undercover at annual meetings of the National Abortion Federation, a nonprofit which represents Planned Parenthood and other abortion providers. Daleiden claimed the videos he obtained show an illegal trade in aborted fetal tissue, including his discovery of price lists and invoices for each specimen or body part. The abortion providers have denied any wrongdoing. Daleiden also spoke about another fetal tissue story out of California that broke recently, which he considered especially important. This Wednesday CNS News reported that the National Institutes for Health has a $13.8 million federal contract with University of California San Francisco. “A federal contract that the National Institutes of Health signed with the University of California at San Francisco requires UCSF to obtain body parts from unborn babies to make at least two types of ‘humanized mice,’ according to ‘the statement of work’ included in the contract solicitation published by NIH,” wrote CNS. Daleiden estimates that the likely number the institute requires is four to six late-term aborted babies per month. He called the university the “biggest late-term abortion training school” in the country. Daleiden, however, emphasized the positive side of the story. “It is clarifying for the abortion debate in this country,” he said, noting that fetal body parts are coveted precisely because they are human. Daleiden ended his talk with praise for the organization. “March for Life has the biggest civil and human rights demonstration in the country,” he said. Anywhere from 50,000 to 100,00 people are expected to attend next year’s march on Jan. 19. 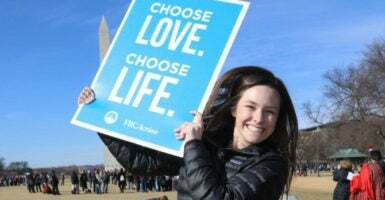 Next year’s march will feature political pundit Ben Shapiro and Abby Johnson, a pro-life activist who was once a Planned Parenthood clinic director, according to a statement March for Life released. The 2019 march is scheduled to take place on Jan. 18 in Washington, D.C.